NASA's Europa Clipper mission, which will study the ocean-harboring Jupiter moon Europa during dozens of flybys, is on track to launch as soon as 2022. NASA's planetary science program is on the right track. The space agency has met or exceeded many of the goals set by the National Academies of Sciences, Engineering and Medicine in the 2013-2022 planetary science decadal survey, according to a new midterm assessment by the National Academies. "NASA relies on the decadal surveys to guide us in everything we do," Lori Glaze, acting director of NASA's Planetary Science division, told Space.com by email. "All of the science that NASA is involved in, from studying other worlds to observing our own planet, is informed by the decadal surveys." The latest decadal survey, called "Vision and Voyages for Planetary Science in the Decade 2013-2022," recommended a slew of planetary flagship missions that would provide an ongoing stream of information about the solar system, as well as some prospective midsize missions. The survey also pinpointed science, research and technology priorities, and included a set of decision rules to deal with funding shortfalls. NASA is required by law to conduct decadal surveys and to prepare midterm assessments of their progress toward meeting the goals outlined within them. The midterm assessment was released earlier this month. "Since the publication of Vision and Voyages, planetary science has made many advances, including acquiring results from several highly successful missions," Louise Prockter, director of the Lunar and Planetary Institute in Houston and co-chair of the committee that conducted the study and wrote the report, said in a statement. "This decadal survey has served the planetary science community well, justifying a plan for planetary science that has been successful in supporting research and obtaining steady funding for missions," she added. Over the past 10 years, NASA has helped to uncover new worlds and discover new features on previously explored planets. For example, the New Horizons mission's epic 2015 flyby revealed Pluto — previously seen only as a blurry smudge — to be a complex world with a stunning diversity of terrain. The atmosphere and magnetic forces of Jupiter have been explored in greater detail than ever before, thanks in large part to the Juno spacecraft. Saturn's icy moon Enceladus and Jupiter's moon Europa were both revealed to host subsurface oceans. The rings, moons and atmosphere of Saturn have been unveiled. And a fleet of spacecraft — including the Curiosity rover, which the summary calls "the most sophisticated rover ever built" — are exploring Mars. Many of these missions evolved from the goals of the previous decadal survey and imperatives. Today, NASA is working to develop two of the most recent decadal survey's top recommended flagship missions: the Mars 2020 rover and Europa Clipper. The ice-covered Europa is home to a subsurface ocean and is therefore regarded as one of the best places in the solar system to look for alien life. NASA's Europa Clipper mission will study that ocean, as well as the frigid crust that overlies it, during dozens of flybys. The probe is expected to launch in the early to mid-2020s. 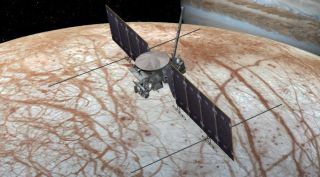 The decadal survey recommended that the two missions that would become Mars 2020 and Europa Clipper be reduced in cost and scope from the original proposed designs. While NASA is well on its way with both of these big-ticket projects, the report warned that such "flagship-class missions pose the greatest potential danger to the overall planetary program if they experience significant cost overruns." The committee recommended the missions, especially Europa Clipper, be closely monitored regarding their cost and schedule. "We're working very hard to make sure that our flagship missions — Mars 2020 and Europa Clipper — do not grow beyond their life-cycle estimates," Glaze said. NASA has also selected two Discovery-class missions, Psyche and Lucy, to investigate the building blocks of the solar system. Slated to launch in 2021, Lucy will tour several of the Trojan asteroids that orbit the sun near Jupiter. With an expected 2022 launch, Psyche will explore the odd metal asteroid of the same name in the asteroid belt, an object scientists think is an ancient, exposed planetary core. NASA also met or exceeded the decadal survey's recommendations for funding research and analysis, and for technology programs, despite budgeting challenges, according to the new report. "Despite significant cuts made to planetary science in the early part of the decadal survey time period, funding for research and analysis and new technologies has been maintained at recommended levels," Glaze said. Vision and Voyages also recommended that NASA begin technology development to enable the next steps of sample return from Mars. Although the agency failed to do so during the first few years of the survey, "by fall of 2017, the Planetary Science Division began technology demonstration tests and had developed a 'focused and rapid' architecture for returning samples from Mars," the report stated. "Although NASA has considerable work to do to make this a reality, the committee was impressed and encouraged by these new developments." The committee also recommended that "NASA should immediately work to reinvigorate international cooperation to help implement Mars exploration more effectively and affordably." Mars 2020 plays a key role in sample return, though there is no mission currently on NASA's books to retrieve the samples the rover will collect and cache. The rover mission includes international partners, with scientific instruments from Norway and Spain. "Science goes beyond borders, and this sample-return effort has allowed us to invigorate international cooperation to make sure we meet this goal," Glaze said. The midterm assessment didn't give NASA a perfect score. The decadal survey outlined a timeline for New Frontiers and Discovery missions for the decade, and NASA has not yet met those goals. Vision and Voyages suggested that Discovery-class spacecraft — a series of low-cost, highly focused missions — have an announcement of opportunity (AO) every 24 months. These AOs allow the scientific community to propose investigations that meet the guidelines for the current cycle. However, the last Discovery AO was in 2014, and the next won't take place until 2019. Unless the agency selects three missions from the next two AOs, the agency will fail to meet the goals outlined in the decadal survey. Why was there such a large gap between the call for Discovery proposals? Glaze said many factors disrupted the cadence. Chief among these were significant cuts made to the planetary science budget in 2012, which she said the agency still feels residually today. Another cause was the delay of the Mars InSight lander mission. InSight, which launched in May 2018 to probe the Red Planet's deep interior, was originally set to launch in 2016 but was delayed by a vacuum seal problem with one of the mission's instruments. NASA "feel[s] very strongly about increasing the cadence of Discovery mission launches, and we are working hard to enable that within our given budget profile," Glaze said. The study also found that the New Frontiers, or medium-size, mission pace is "significantly behind" the recommended cadence of two per decade; only a single mission is likely this decade, the report predicted. In addition, the last New Frontiers call included an "Ocean Worlds" call to the outer planets, which the review noted is "outside the decadal survey process." Most planetary science groups were opposed to the change, according to the review, which warned that "such a process could undermine the scientific priorities of the decadal survey and community support for them." The committee recommended that, when scientific discoveries or external factors compel NASA to reassess decadal survey priorities, the changes be vetted by the Space Studies Board's Committee on Astrobiology and Planetary Science, which was not authorized to express a formal position on the change at the time. Currently, the New Frontiers program is assessing two candidates for the next mission. Dragonfly, which features a highly mobile quadcopter drone, would explore another potentially habitable world, Saturn's huge moon Titan. And the Comet Astrobiology Exploration Sample Return (CAESAR) mission would attempt to return a sample from 67P/Churyumov-Gerasimenko, a comet that was successfully explored recently by the European Space Agency's Rosetta spacecraft. According to Glaze, NASA expects to release an additional AO for a New Frontiers mission before the end of the current decadal period. That fits within the committee's recommendation to issue the next New Frontiers AO as soon as possible, and by December 2021 at the latest. Themes for possible New Frontiers missions include a Venus explorer, a sample-return mission to the moon's South Pole Aitken Basin, a comet sample return, an Ocean Worlds (Titan and Enceladus) mission, a Trojan tour, a lunar geophysical network, exploration of Jupiter's volcanic moon Io and a Saturn atmospheric probe. The report also pointed out that the three NASA spacecraft currently studying Mars from orbit have already exceeded their design lifetimes. In addition to providing science, these three — Mars Odyssey, the Mars Reconnaissance Orbiter, and the Mars Atmosphere and Volatile Evolution (MAVEN) probe — serve as vital communication links between mission control and rovers and landers on the Martian surface. "The system is fragile and aging," the midterm report warned. "The loss of even one of the three U.S. orbiters capable of relay communications would create tactical challenges for continued operation of current and planned landed missions beyond 2021."